If you want to enjoy true natural beauty, state parks provide plenty of beautiful sights, sounds, and scenes for you to do exactly that. And in the state of Arizona, there are many, many beautiful state parks you can enjoy. The best state parks in Arizona feature natural bridges, red rocks, and so much more. Here are our picks for the top 10. The Tonto Natural Bridge park features four different trails that visitors of all ages can enjoy. It's important to note, though, that all of the trails are steep and may be strenuous for those not accustomed to hiking. But, if you can manage these tough trails, you'll be rewarded with a waterfall cave, creek, observation deck, and the namesake natural bridge. Don't forget to pack an ample amount of drinking water and wear hiking shoes! Without a doubt, the red rocks are one of Arizona's most popular scenic destinations. These bright, vivid rocks in the Sedona area are well-known for their diverse geology, plant life, and wildlife. Red Rock State Park is a nature preserve with 286 acres for you to explore via hiking trails—complete with a visitor's center, theater, ramada, and more. Some state parks have more features than others. At Buckskin Mountain, which is located between the Parker and Headgate dams on the Parker Strip, you can do just about anything. Camp in an RV or tent, go boating, swimming, or fishing on the water, check out the trails, or even host an event or wedding. Buckskin Mountain State Park is a "scenic respite, mountain hike, desert escape, and fun-filled water adventure" all in one. According to the Arizona State Parks website, Cattail Cove offers a "broad spectrum of activities for all to enjoy." Whether you want to work on your tan on the beach, go boating, or camp at one of the 61 sites, Cattail Cove will appeal to you and your companions equally. Enjoy some peace and tranquility by way of Lake Havasu today. Are desert plants and wildlife your "thing"? Then you'll feel right at home at Catalina State Park, which sits at the bottom of the Santa Catalina Mountains. The park houses approximately 5,000 saguaro cacti—and spans over 5,000 acres. There are canyons, streams, and foothills, perfect for camping, going on a picnic, or hiking—all of which you can easily do here. 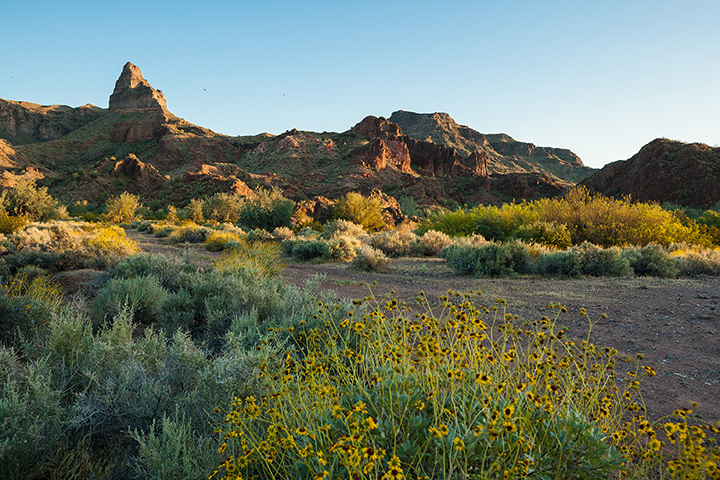 Located 40 miles east of the city of Phoenix in the Sonoran Desert, the Lost Dutchman State Park is named after the famed gold mine. Hike one of the park's trails in spring, and you just might bear witness to a swath of native desert wildflowers. Spend some time camping, and you may also encounter some of the native wildlife, such as jackrabbits, coyote, and mule deer. Do you love fishing? What about fishing for bass? If the answer's yes, you might already know about Alamo Lake, because it's one of the best bass fishing spots in the state. If you didn't know, now you do! You can thank me later. River Island State Park is a year-round destination set against a backdrop of mountains. With 37 campsites set along a sandy beach and cove, you have ample opportunities for water adventures. In addition to activities like swimming, boating, fishing, and jet skiing, visitors can also go on hikes and access back country roads. In Hopi, Homolovi translates to the "Place of the Little Hills." The Homolovi State Park currently serves as one of the research centers for the migration period of the Hopi. The state park currently gives visitors the opportunity to visit the park's sites and use facilities like a museum, trails, and campground. Picnic tables and pullouts are also available for use. Kartchner Caverns State Park was discovered in 1974 by Gary Tenen and Randy Tufts. The two told property owners (James and Lois Kartchner) of their discovery—who then decided to ensure that the cave was protected. Members of the family contacted Arizona State Parks about acquiring the cave, and it is now open for public use.